Sportswear firm Adidas has blamed impairment charges relating to the Reebok brand for pushing it to a fourth quarter loss. The company today (7 March) recorded a net loss of EUR7m (US$9.1m) over the quarter ended 31 December against a EUR3m profit in the same period of the prior year. The company attributed the losses to EUR265m in goodwill impairment, following the "re-evaluation of medium-term growth prospects of several geographic regions and segments" - mainly the Reebok brand in North America, Latin America, and Brazil. On a currency neutral basis, sales grew 1%, but rose 4% in euros to reach EUR3.37bn over the quarter. During the full year, net income fell 14% to EUR526m. Excluding the goodwill impairment, net income grew EUR791m, a 29% increase. Revenue rose 6% on a currency neutral basis, rising 12% in euros to EUR14.8bn. Gross margin increased 0.2 percentage points to 47.7%, which it attributed to product price increase, a more favourable product and regional sales mix and a high proportion of retail sales, which more than offset higher input costs. 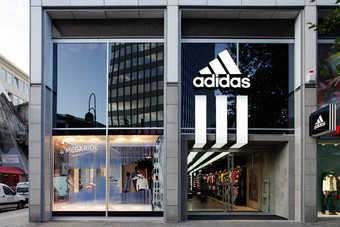 "2012 has been another successful year for the Adidas Group," said Adidas Group CEO Herbert Hainer. "Our products and brands were again at the fore, not only being the most visible at the year's major sports events, but also enjoying several important market share victories along the way. "The resulting margin improvements and significant cash flow generation underpin the trajectory and value we are unlocking with our Route 2015 strategic plan."